Thanks for shopping with us here at KnightRiderOnline, readers who liked this selection also enjoyed these other threads. Ewww. For one, that look on the Trans Ams looks so 80's and 90's and is not very appealing compaired to todays vehicles, especially if it looks like a lifted car. Second, they don't make the Trans Am anymore. It would probably be another 5 years until GM decides to make another Trans Am (IF WE SEE ONE BY THEN). Third, as mentioned from one of the earlier comments, GM already gave away the Camaro to Transformers as Bumble Bee leaving that already beeing the hero car for that movie. Might as well use the Shelby-Cobra GT500KR as the hero car for Knight Rider. The Camaro is a good looking car, but I wouldn't say in black. It would Probably look better if it was a different color, but according to Knight Rider, the car has to be black. After these picks I'm lookin at, the Mustang clearly looks much better (ESPECIALLY IN BLACK). You guys can suggest all you want about how much the car should be a Camaro, but after the icon KITT already made himself to be with the Mustang, it would be cheesy if they decide to change it now. It's way too late anyway. Besides the directors and the producers already completed all the episodes of this season with that Shelby before they decided to air the show. Go ahead and keep saying these suggestions all you want about KITT bein' a GM car. It's already too late, they're not gonna change it. Kevin Morgan's TA designs. 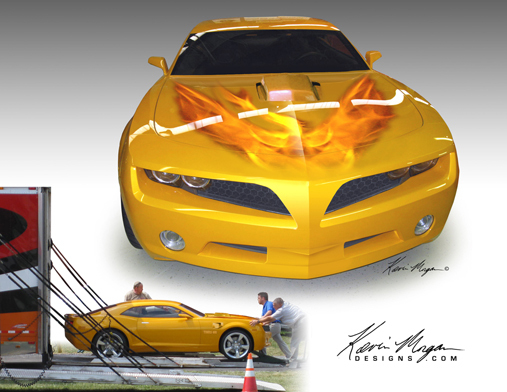 If any1 wants to see the designs KM did, you can go to kevinmorgandesigns.com. let's give the new KITT Mustang a tire-smokin chance. Sue wrote: ROTFL Yes, yes it is. LOL I would almost smile... as I see the irony... but... I can't .... sooooo tired.... do I always have to explain why for most of us the Mustang works? Sue wrote: Thanks for shopping with us here at KnightRiderOnline, readers who liked this selection also enjoyed these other threads. Ok LOL that I do find funny, tired or not. Well, if you want to speak of tradition, what about the tradition of producing cars ON AMERICAN SOIL, generating good blue collar jobs with union pay!!! Ford, General Motors and Chrysler have been major employers here in the United States for 100 years. Then, recently, they start exporting those jobs to Canada and Mexico. The Camaro is made in Canada, the Mustang is Made in USA, they are BOTH boxy. That Trans Am that was previously shown from was from the 90s, not today. The Camaro Concept-based Trans Am is going to be far more boxy. Plus the 90s Trans Am was also made in Canada. The three American Muscle cars that are left are: Chevrolet Corvette, Ford Mustang, Dodge Viper. Of those three, only the Ford Mustang has a backseat. There are other cool looking (in my opinion) cars that are made here and have a backseat, but they are regarded as "dorky" by gearheads because they are FWD and don't have V8s. Long live the FORD MUSTANG, **American Muscle**, emphasis on the American part. 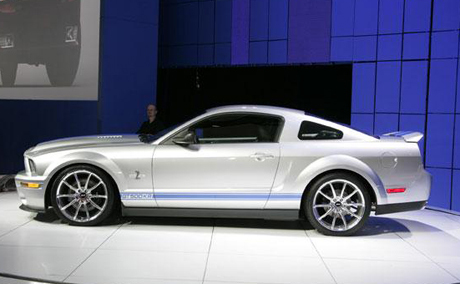 observe the side view at the bottom...you're telling me that is less boxy than the Mustang GT500KR????????? At least the Mustang supports good, steady jobs for Americans with union pay! Glad Sue went about looking up all those links, I was tempted to do it but I didn't have the guts to go back and have to go through all them them and the idiocy contained within. I couldn't help but actually revisit those threads for some reason. I would definitely say that the Concept TA is less boxy than the Mustang GT500KR. And I would say the KR definitely looks nicer than that fake TransAm... the TA is only an artist impression of a car which will not be built. Kitt in a Camaro would save the show. Really? Cause the show seems to be doing just fine without it. Was that comment really worth reviving a near-month old thread? Do you really think it added anything? Rjaniz wrote: Was that comment really worth reviving a near-month old thread? Do you really think it added anything? Which is funny, cause everything he's said isnt true. wow. Rjaniz wrote: Really? Cause the show seems to be doing just fine without it. You got that right, this new version is already heading on the same level as TKR. 89IROCNDoug wrote: I would definitely say that the Concept TA is less boxy than the Mustang GT500KR. Well, just looking at the image you posted, the Mustang has much bigger windows. The Camaro is "boxy" at its finest. This Camaro bears no significant resemblance to the 82 Trans Am that I can see, and bears more similarity to a Ford Mustang. In fact, it is basically a GM version of a mustang....that's not even made in America. So, you punch KITT in the nose, stretch out his cheeks, and you get this new Camaro...and in the process, you take jobs away from Americans. GM's American Muscle Car is the Corvette. The Camaro would be Canadian Muscle. Specifically BOXY Canadian Muscle. Except the camaro is way sleeker than the mustang, the mustang may sleek, but it's not even sleeker at all. Holy crap, children, lighten up. Would I have preferred the Camaro? Yes. Do I like Fords? No. But do I have any problems with KITT as a Mustang? No. He looks pretty cool. I wish he had black wheels and I know the simply construction of it probably would keep blacked-out brakes from looking good, but I wish there were a way, I wish he were a little more modified and not quite so stock...but they would have done that with the Camaro even. And may I again repeat GM deserves it for the absolute idiocy of not letting KR call KITT a Trans Am back when the show was on! But they're definitely not gonna change the car now (unless Ford goes under...which I suppose isn't completely impossible...). As for where the car is built...I don't remember Knight Rider having anything to do with American jobs. Besides, Camaro's are built in CANADA! It's not like they're being made in some vietnamese sweat shop, lighten up. Indeed, the Corvette looks far more like a KITT type car. kitt34 wrote: Except the camaro is way sleeker than the mustang, the mustang may sleek, but it's not even sleeker at all. Ah man, I don't know how you guys can say that. They both have a 90 degree front end, the back end is quite similar on both, if anything the Camaro is more boxy than the Mustang. You can't even see out the side window on that Camaro because said window is so small! I think if GM bought the Scion brand from Toyota, and renamed it the Scion xD, calling it "2010 Pontiac Trans Am" you guys would be like "the 2010 Pontiac Trans Am should be KITT!!!". The front end on the Camaro curves out and has a soft point on the front, whereas the Mustang has a slight curve on the front bumper, but is pretty much straight across. The back end on the Camaro curves out a little, but is straight on the Mustang. The Camaro is definitely not as boxy as the Mustang.